Let your love for a beloved state shine with this neon wall art. Let your love for a beloved state shine with this neon wall art. 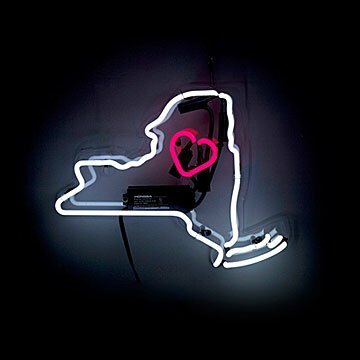 The iconic silhouettes of your choice of New York, Florida, or California are rendered in radiant neon tubing accented with an illuminated heart. Mounted on high quality transparent acrylic with two holes for easy mounting on your wall, it includes a UL certified transformer and 6 foot long power cord with switch. It makes a bold addition to an office or family room, and a brilliant gift for anyone with playful pride of place. Not intended for outdoor use. Made in China. Clean with a soft, dry cloth while product is off and unplugged. Not intended for outdoor use. This item is adorable. My only comment is that all neon lights need sort of a sub structure to keep the glass tubing safe and in place - that item is black for our piece. So it is a good idea to think about hanging this on a dark surface so it does not become distracting.